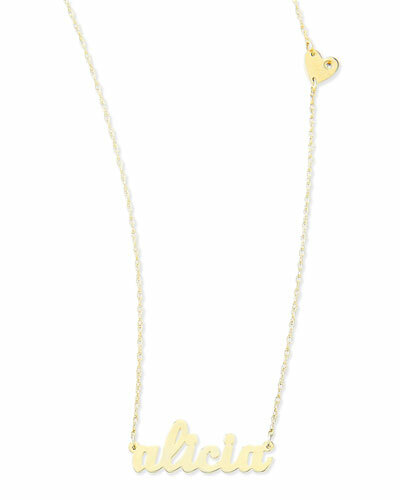 More Details Sarah Chloe Mini Amelia Diamond Initial Pendant Necklace Details Mini Amelia pendant necklace by Sarah Chloe. 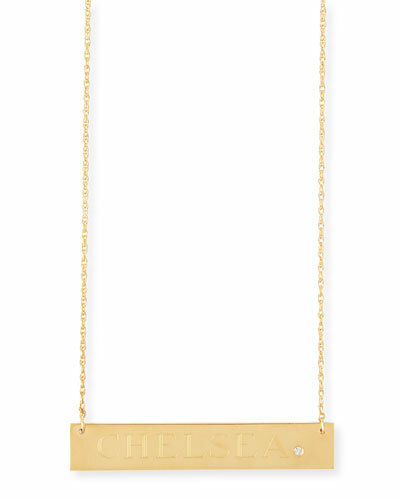 Polished 14-karat gold chain and hardware. 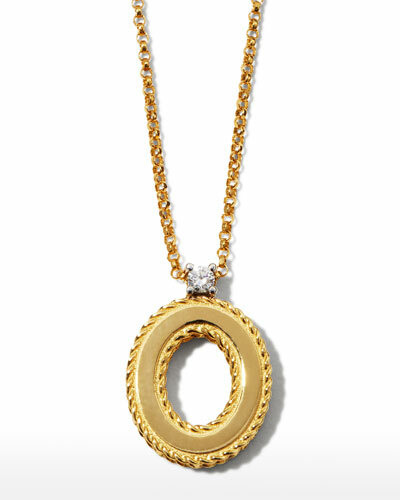 Your choice of one letter in diamond pavé. 0.05-0.11 total diamond carat weight. Approx. 16"L chain; 0.3"L pendant. Made in USA. Please Note: Personalized items may not be ordered blank. Please order carefully. Orders for personalized items cannot be canceled, and personalized items cannot be returned. 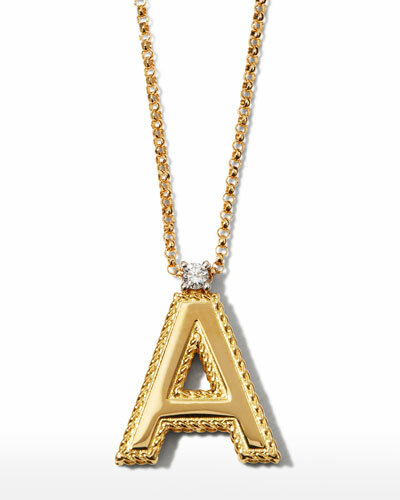 Sarah Chloe Mini Amelia Diamond Initial Pendant Necklace Details Mini Amelia pendant necklace by Sarah Chloe. Polished 14-karat gold chain and hardware. 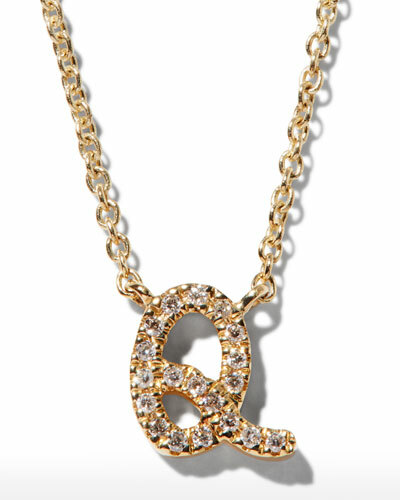 Your choice of one letter in diamond pavé. 0.05-0.11 total diamond carat weight. Approx. 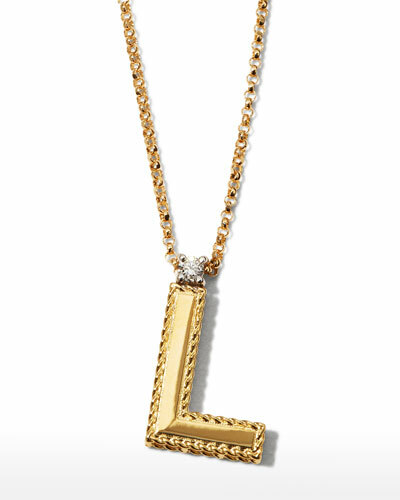 16"L chain; 0.3"L pendant. Made in USA. Please Note: Personalized items may not be ordered blank. Please order carefully. 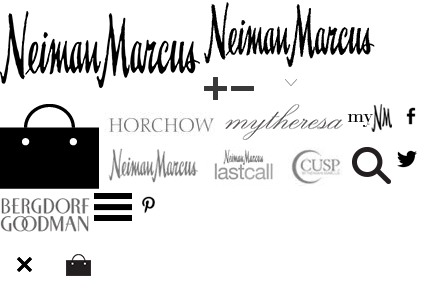 Orders for personalized items cannot be canceled, and personalized items cannot be returned. More Details Sarah Chloe Amelia Layered Diamond Initial Necklace Details Amelia layered pendant necklace by Sarah Chloe. 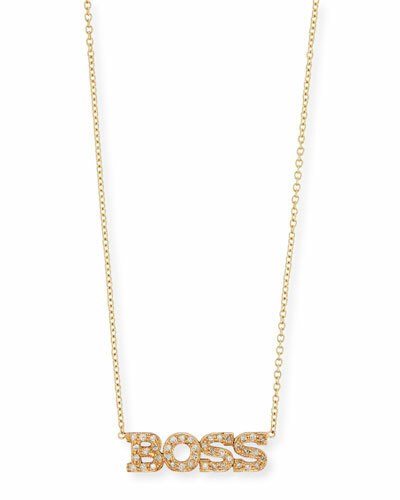 Solid 14-karat yellow gold chain and hardware. 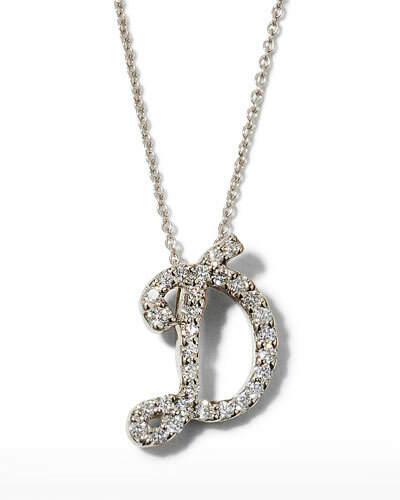 Two diamond initials with diamond heart charm. 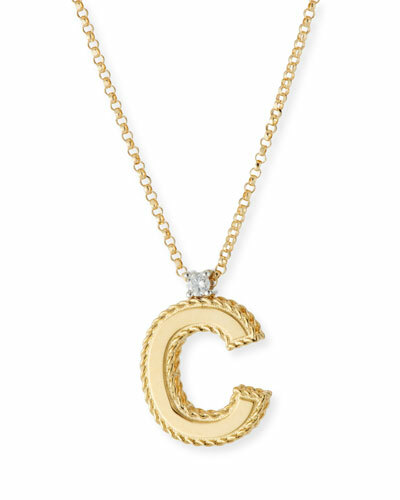 Your choice of two capital letter pendants. 0.10-0.22 total diamond carat weight. Made in USA. Please Note: Personalized items may not be ordered blank. Please order carefully. Orders for personalized items cannot be canceled, and personalized items cannot be returned. 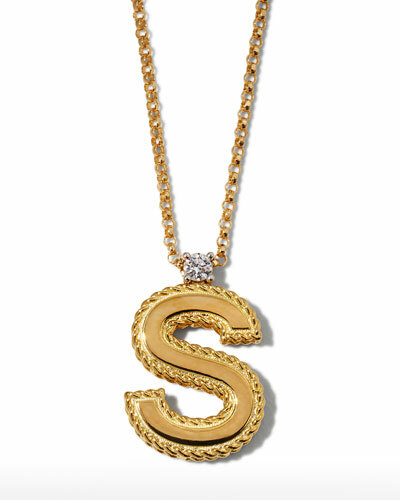 Sarah Chloe Amelia Layered Diamond Initial Necklace Details Amelia layered pendant necklace by Sarah Chloe. 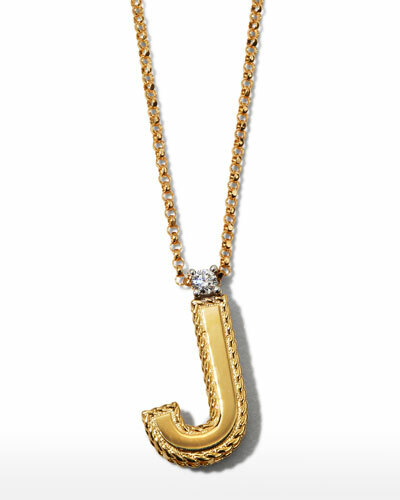 Solid 14-karat yellow gold chain and hardware. 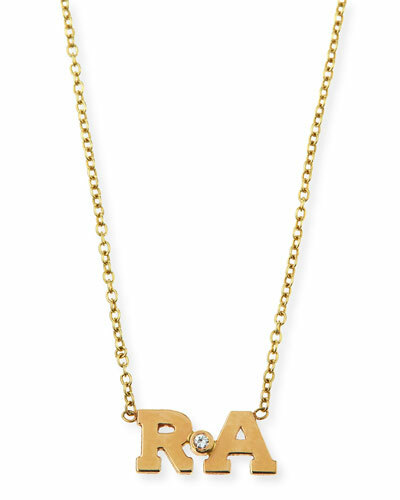 Two diamond initials with diamond heart charm. Your choice of two capital letter pendants. 0.10-0.22 total diamond carat weight. Made in USA. Please Note: Personalized items may not be ordered blank. Please order carefully. Orders for personalized items cannot be canceled, and personalized items cannot be returned. 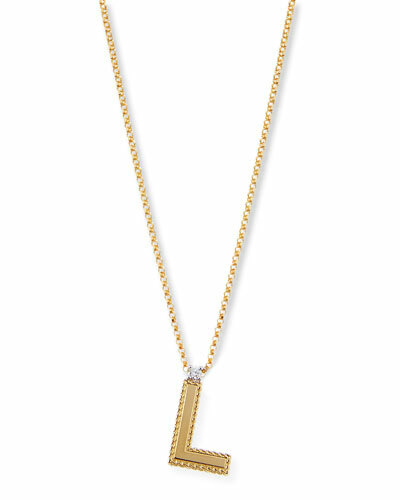 More Details K Kane Code Flag Square Diamond Pendant Necklace - G Details Code flag square pendant necklace by K Kane. Maritime flag signal for the letter G. Polished 10-karat yellow gold hardware. Integrated flag pendant with diamond. 0.02 total diamond carat weight. Approx. 15"L; 2"L extender. Adjustable; lobster clasp. Made in USA. K Kane Code Flag Square Diamond Pendant Necklace - G Details Code flag square pendant necklace by K Kane. Maritime flag signal for the letter G. Polished 10-karat yellow gold hardware. Integrated flag pendant with diamond. 0.02 total diamond carat weight. Approx. 15"L; 2"L extender. Adjustable; lobster clasp. Made in USA. More Details K Kane Code Flag Square Diamond Pendant Necklace - C Details Code flag square pendant necklace by K Kane. Maritime flag signal for the letter C. Polished 10-karat yellow gold hardware. Integrated flag pendant with diamond. 0.02 total diamond carat weight. Approx. 15"L; 2"L extender. Adjustable; lobster clasp. Made in USA. 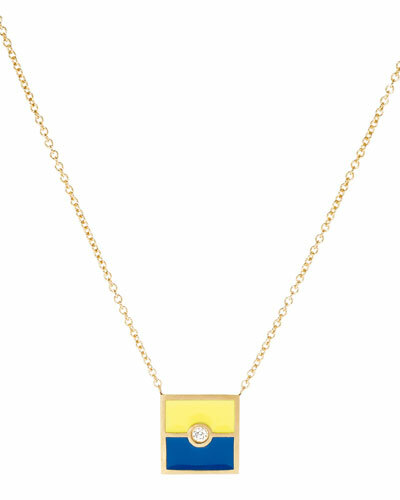 K Kane Code Flag Square Diamond Pendant Necklace - C Details Code flag square pendant necklace by K Kane. Maritime flag signal for the letter C. Polished 10-karat yellow gold hardware. Integrated flag pendant with diamond. 0.02 total diamond carat weight. Approx. 15"L; 2"L extender. Adjustable; lobster clasp. Made in USA. More Details K Kane Code Flag Diamond Pendant Necklace - A Details Code flag square pendant necklace by K Kane. Maritime flag signal for the letter A. Polished 10-karat yellow gold hardware. Integrated flag pendant with diamond. 0.02 total diamond carat weight. Approx. 15"L; 2"L extender. Adjustable; lobster clasp. Made in USA. K Kane Code Flag Diamond Pendant Necklace - A Details Code flag square pendant necklace by K Kane. Maritime flag signal for the letter A. Polished 10-karat yellow gold hardware. Integrated flag pendant with diamond. 0.02 total diamond carat weight. Approx. 15"L; 2"L extender. Adjustable; lobster clasp. Made in USA. More Details K Kane Code Flag Diamond Pendant Necklace - B Details Code flag pendant necklace by K Kane. Maritime flag signal for the letter B. Polished 10-karat yellow gold hardware. Integrated flag pendant with diamond. 0.02 total diamond carat weight. Approx. 15"L; 2"L extender. Adjustable; lobster clasp. Made in USA. 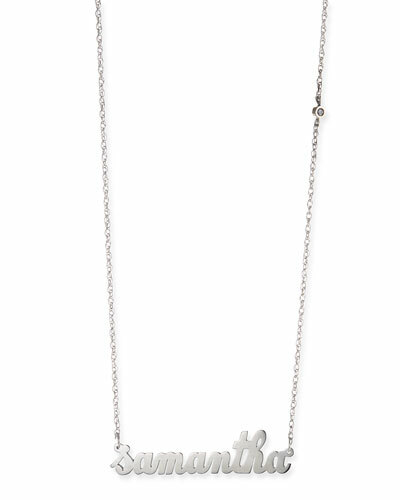 K Kane Code Flag Diamond Pendant Necklace - B Details Code flag pendant necklace by K Kane. 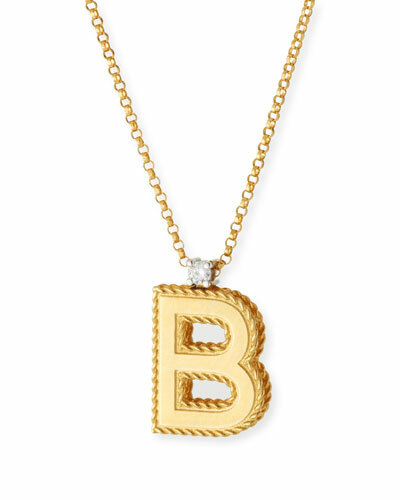 Maritime flag signal for the letter B. Polished 10-karat yellow gold hardware. Integrated flag pendant with diamond. 0.02 total diamond carat weight. Approx. 15"L; 2"L extender. Adjustable; lobster clasp. Made in USA. 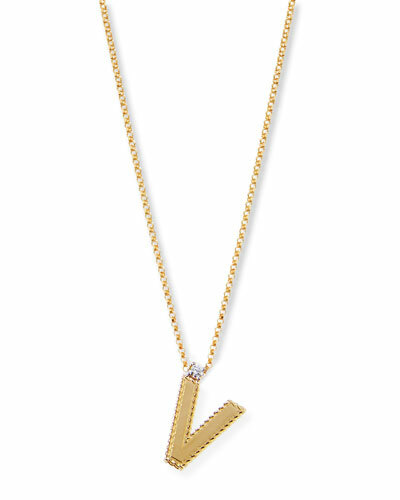 More Details K Kane Code Flag Square Diamond Pendant Necklace - V Details Code flag square pendant necklace by K Kane. Maritime flag signal for the letter V. Polished 10-karat yellow gold hardware. Integrated flag pendant with diamond. 0.02 total diamond carat weight. Approx. 15"L; 2"L extender. Adjustable; lobster clasp. Made in USA. 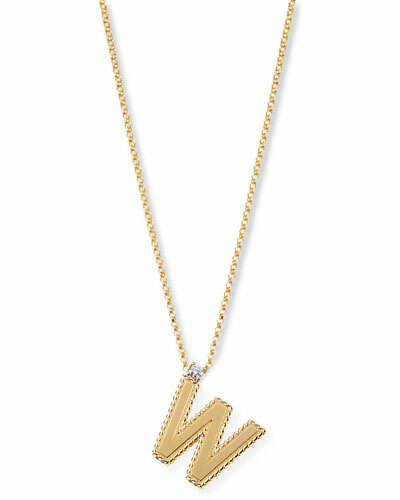 K Kane Code Flag Square Diamond Pendant Necklace - V Details Code flag square pendant necklace by K Kane. Maritime flag signal for the letter V. Polished 10-karat yellow gold hardware. Integrated flag pendant with diamond. 0.02 total diamond carat weight. Approx. 15"L; 2"L extender. Adjustable; lobster clasp. Made in USA. 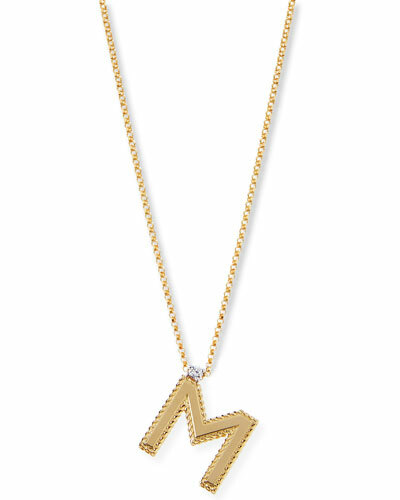 More Details K Kane Code Flag Square Diamond Pendant Necklace - M Details Code flag square pendant necklace by K Kane. Maritime flag signal for the letter M. Polished 10-karat yellow gold hardware. Integrated flag pendant with diamond. 0.02 total diamond carat weight. Approx. 15"L; 2"L extender. Adjustable; lobster clasp. Made in USA. 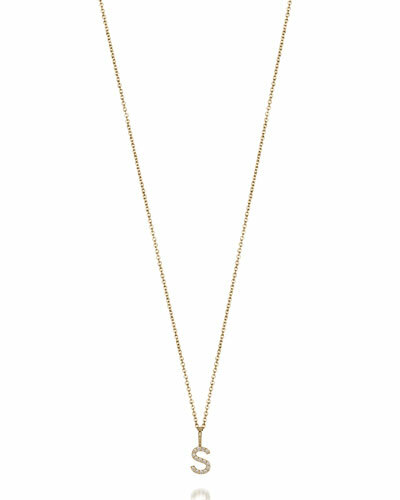 K Kane Code Flag Square Diamond Pendant Necklace - M Details Code flag square pendant necklace by K Kane. Maritime flag signal for the letter M. Polished 10-karat yellow gold hardware. 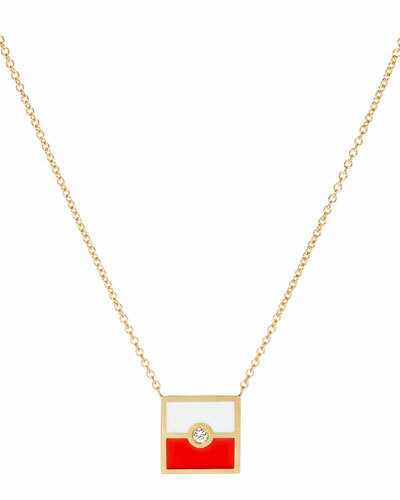 Integrated flag pendant with diamond. 0.02 total diamond carat weight. Approx. 15"L; 2"L extender. Adjustable; lobster clasp. Made in USA. 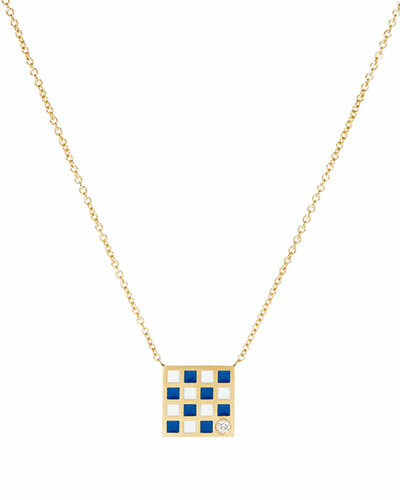 More Details K Kane Code Flag Square Diamond Pendant Necklace - W Details Code flag square pendant necklace by K Kane. Maritime flag signal for the letter W. Polished 10-karat yellow gold hardware. Integrated flag pendant with diamond. 0.02 total diamond carat weight. Approx. 15"L; 2"L extender. Adjustable; lobster clasp. Made in USA. 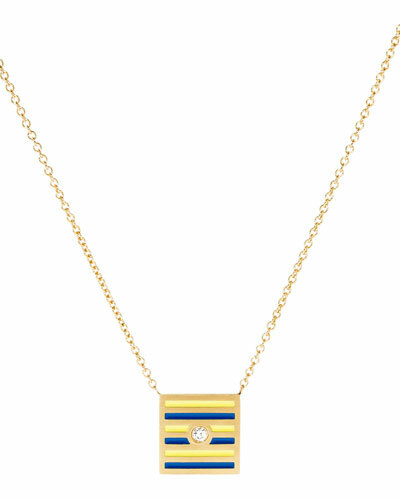 K Kane Code Flag Square Diamond Pendant Necklace - W Details Code flag square pendant necklace by K Kane. Maritime flag signal for the letter W. Polished 10-karat yellow gold hardware. Integrated flag pendant with diamond. 0.02 total diamond carat weight. Approx. 15"L; 2"L extender. Adjustable; lobster clasp. Made in USA. More Details K Kane Code Flag Square Diamond Pendant Necklace - P Details Code flag square pendant necklace by K Kane. 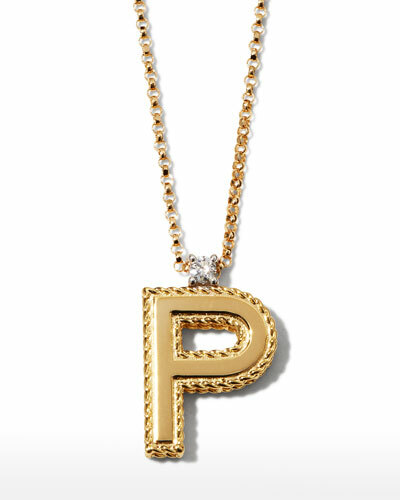 Maritime flag signal for the letter P. Polished 10-karat yellow gold hardware. Integrated flag pendant with diamond. 0.02 total diamond carat weight. Approx. 15"L; 2"L extender. Adjustable; lobster clasp. Made in USA. K Kane Code Flag Square Diamond Pendant Necklace - P Details Code flag square pendant necklace by K Kane. Maritime flag signal for the letter P. Polished 10-karat yellow gold hardware. Integrated flag pendant with diamond. 0.02 total diamond carat weight. Approx. 15"L; 2"L extender. Adjustable; lobster clasp. Made in USA. 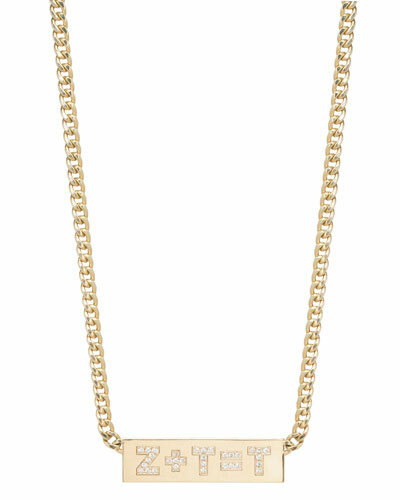 More Details K Kane Code Flag Square Diamond Pendant Necklace - F Details Code flag square pendant necklace by K Kane. Maritime flag signal for the letter F. Polished 10-karat yellow gold hardware. Integrated flag pendant with diamond. 0.02 total diamond carat weight. Approx. 15"L; 2"L extender. Adjustable; lobster clasp. Made in USA. K Kane Code Flag Square Diamond Pendant Necklace - F Details Code flag square pendant necklace by K Kane. Maritime flag signal for the letter F. Polished 10-karat yellow gold hardware. Integrated flag pendant with diamond. 0.02 total diamond carat weight. Approx. 15"L; 2"L extender. Adjustable; lobster clasp. Made in USA. More Details K Kane Code Flag Square Diamond Pendant Necklace - S Details Code flag square pendant necklace by K Kane. Maritime flag signal for the letter S. Polished 10-karat yellow gold hardware. Integrated flag pendant with diamond. 0.02 total diamond carat weight. Approx. 15"L; 2"L extender. Adjustable; lobster clasp. Made in USA. K Kane Code Flag Square Diamond Pendant Necklace - S Details Code flag square pendant necklace by K Kane. Maritime flag signal for the letter S. Polished 10-karat yellow gold hardware. Integrated flag pendant with diamond. 0.02 total diamond carat weight. Approx. 15"L; 2"L extender. Adjustable; lobster clasp. Made in USA. More Details K Kane Code Flag Square Diamond Pendant Necklace - H Details Code flag square pendant necklace by K Kane. Maritime flag signal for the letter H. Polished 10-karat yellow gold hardware. Integrated flag pendant with diamond. 0.02 total diamond carat weight. Approx. 15"L; 2"L extender. Adjustable; lobster clasp. Made in USA. K Kane Code Flag Square Diamond Pendant Necklace - H Details Code flag square pendant necklace by K Kane. 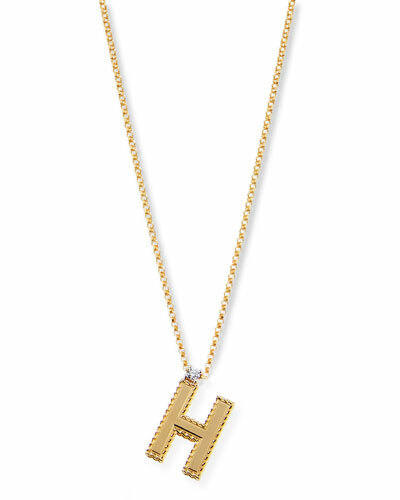 Maritime flag signal for the letter H. Polished 10-karat yellow gold hardware. Integrated flag pendant with diamond. 0.02 total diamond carat weight. Approx. 15"L; 2"L extender. Adjustable; lobster clasp. Made in USA. More Details K Kane Code Flag Square Diamond Pendant Necklace - I Details Code flag square pendant necklace by K Kane. Maritime flag signal for the letter I. Polished 10-karat yellow gold hardware. Integrated flag pendant with diamond. 0.02 total diamond carat weight. Approx. 15"L; 2"L extender. Adjustable; lobster clasp. Made in USA. K Kane Code Flag Square Diamond Pendant Necklace - I Details Code flag square pendant necklace by K Kane. Maritime flag signal for the letter I. Polished 10-karat yellow gold hardware. Integrated flag pendant with diamond. 0.02 total diamond carat weight. Approx. 15"L; 2"L extender. Adjustable; lobster clasp. Made in USA. More Details K Kane Code Flag Square Diamond Pendant Necklace - R Details Code flag square pendant necklace by K Kane. 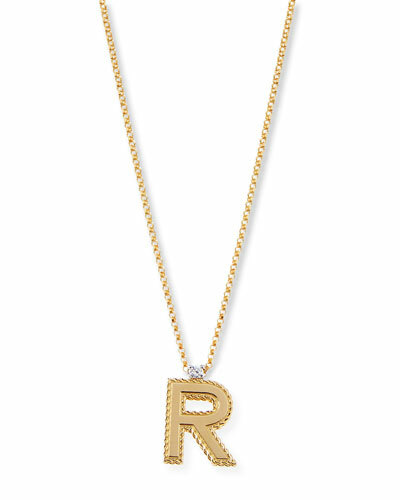 Maritime flag signal for the letter R. Polished 10-karat yellow gold hardware. Integrated flag pendant with diamond. 0.02 total diamond carat weight. Approx. 15"L; 2"L extender. Adjustable; lobster clasp. Made in USA. K Kane Code Flag Square Diamond Pendant Necklace - R Details Code flag square pendant necklace by K Kane. Maritime flag signal for the letter R. Polished 10-karat yellow gold hardware. Integrated flag pendant with diamond. 0.02 total diamond carat weight. Approx. 15"L; 2"L extender. Adjustable; lobster clasp. Made in USA. 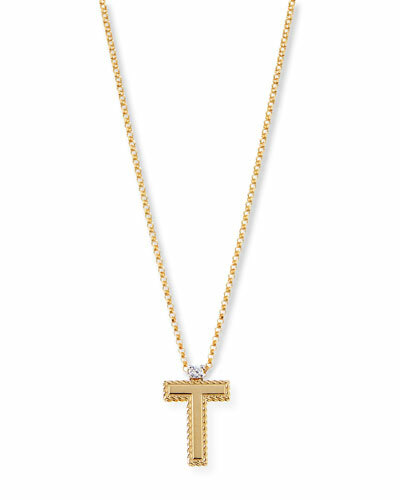 More Details K Kane Code Flag Square Diamond Pendant Necklace - T Details Code flag square pendant necklace by K Kane. Maritime flag signal for the letter T. Polished 10-karat yellow gold hardware. Integrated flag pendant with diamond. 0.02 total diamond carat weight. Approx. 15"L; 2"L extender. Adjustable; lobster clasp. Made in USA. K Kane Code Flag Square Diamond Pendant Necklace - T Details Code flag square pendant necklace by K Kane. Maritime flag signal for the letter T. Polished 10-karat yellow gold hardware. Integrated flag pendant with diamond. 0.02 total diamond carat weight. Approx. 15"L; 2"L extender. Adjustable; lobster clasp. Made in USA. More Details K Kane Code Flag Square Diamond Pendant Necklace - K Details Code flag square pendant necklace by K Kane. Maritime flag signal for the letter K. Polished 10-karat yellow gold hardware. Integrated flag pendant with diamond. 0.02 total diamond carat weight. Approx. 15"L; 2"L extender. Adjustable; lobster clasp. Made in USA. 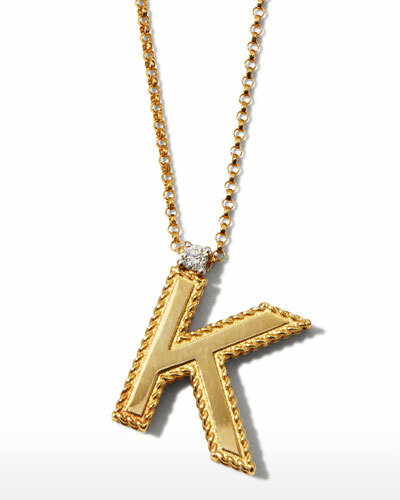 K Kane Code Flag Square Diamond Pendant Necklace - K Details Code flag square pendant necklace by K Kane. Maritime flag signal for the letter K. Polished 10-karat yellow gold hardware. Integrated flag pendant with diamond. 0.02 total diamond carat weight. Approx. 15"L; 2"L extender. Adjustable; lobster clasp. Made in USA. More Details K Kane Code Flag Square Diamond Pendant Necklace - J Details Code flag square pendant necklace by K Kane. Maritime flag signal for the letter J. Polished 10-karat yellow gold hardware. Integrated flag pendant with diamond. 0.02 total diamond carat weight. Approx. 15"L; 2"L extender. Adjustable; lobster clasp. Made in USA. K Kane Code Flag Square Diamond Pendant Necklace - J Details Code flag square pendant necklace by K Kane. Maritime flag signal for the letter J. Polished 10-karat yellow gold hardware. Integrated flag pendant with diamond. 0.02 total diamond carat weight. Approx. 15"L; 2"L extender. Adjustable; lobster clasp. Made in USA. More Details K Kane Code Flag Square Diamond Pendant Necklace - Q Details Code flag square pendant necklace by K Kane. Maritime flag signal for the letter Q. Polished 10-karat yellow gold hardware. Integrated flag pendant with diamond. 0.02 total diamond carat weight. Approx. 15"L; 2"L extender. Adjustable; lobster clasp. Made in USA. K Kane Code Flag Square Diamond Pendant Necklace - Q Details Code flag square pendant necklace by K Kane. 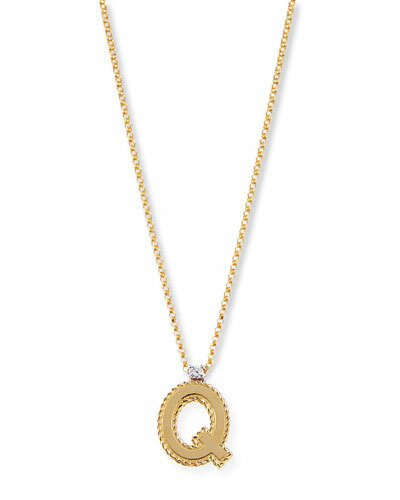 Maritime flag signal for the letter Q. Polished 10-karat yellow gold hardware. Integrated flag pendant with diamond. 0.02 total diamond carat weight. Approx. 15"L; 2"L extender. Adjustable; lobster clasp. Made in USA. More Details K Kane Code Flag Square Diamond Pendant Necklace - D Details Code flag square pendant necklace by K Kane. Maritime flag signal for the letter D. Polished 10-karat yellow gold hardware. Integrated flag pendant with diamond. 0.02 total diamond carat weight. Approx. 15"L; 2"L extender. Adjustable; lobster clasp. Made in USA. K Kane Code Flag Square Diamond Pendant Necklace - D Details Code flag square pendant necklace by K Kane. Maritime flag signal for the letter D. Polished 10-karat yellow gold hardware. Integrated flag pendant with diamond. 0.02 total diamond carat weight. Approx. 15"L; 2"L extender. Adjustable; lobster clasp. Made in USA. More Details K Kane Code Flag Square Diamond Pendant Necklace - Y Details Code flag square pendant necklace by K Kane. Maritime flag signal for the letter Y. Polished 10-karat yellow gold hardware. Integrated flag pendant with diamond. 0.02 total diamond carat weight. Approx. 15"L; 2"L extender. Adjustable; lobster clasp. Made in USA. K Kane Code Flag Square Diamond Pendant Necklace - Y Details Code flag square pendant necklace by K Kane. Maritime flag signal for the letter Y. Polished 10-karat yellow gold hardware. Integrated flag pendant with diamond. 0.02 total diamond carat weight. Approx. 15"L; 2"L extender. Adjustable; lobster clasp. Made in USA. More Details K Kane Code Flag Square Diamond Pendant Necklace - Z Details Code flag square pendant necklace by K Kane. Maritime flag signal for the letter Z. Polished 10-karat yellow gold hardware. Integrated flag pendant with diamond. 0.02 total diamond carat weight. Approx. 15"L; 2"L extender. Adjustable; lobster clasp. Made in USA. 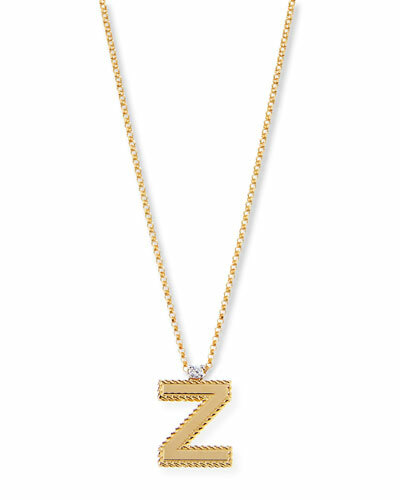 K Kane Code Flag Square Diamond Pendant Necklace - Z Details Code flag square pendant necklace by K Kane. Maritime flag signal for the letter Z. Polished 10-karat yellow gold hardware. Integrated flag pendant with diamond. 0.02 total diamond carat weight. Approx. 15"L; 2"L extender. Adjustable; lobster clasp. Made in USA. More Details K Kane Code Flag Square Diamond Pendant Necklace - E Details Code flag square pendant necklace by K Kane. Maritime flag signal for the letter E. Polished 10-karat yellow gold hardware. Integrated flag pendant with diamond. 0.02 total diamond carat weight. Approx. 15"L; 2"L extender. Adjustable; lobster clasp. Made in USA. 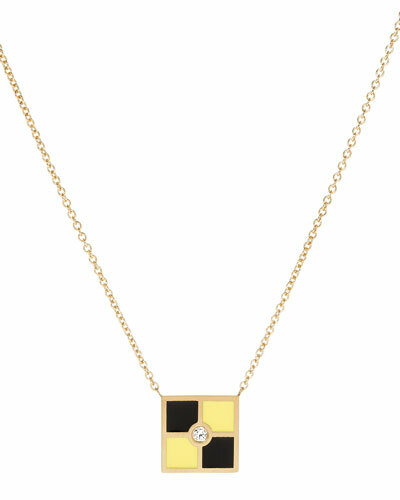 K Kane Code Flag Square Diamond Pendant Necklace - E Details Code flag square pendant necklace by K Kane. Maritime flag signal for the letter E. Polished 10-karat yellow gold hardware. Integrated flag pendant with diamond. 0.02 total diamond carat weight. Approx. 15"L; 2"L extender. Adjustable; lobster clasp. Made in USA. More Details K Kane Code Flag Square Diamond Pendant Necklace - N Details Code flag square pendant necklace by K Kane. 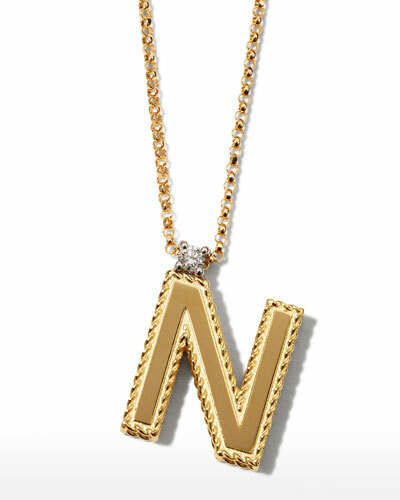 Maritime flag signal for the letter N. Polished 10-karat yellow gold hardware. Integrated flag pendant with diamond. 0.02 total diamond carat weight. Approx. 15"L; 2"L extender. Adjustable; lobster clasp. Made in USA. 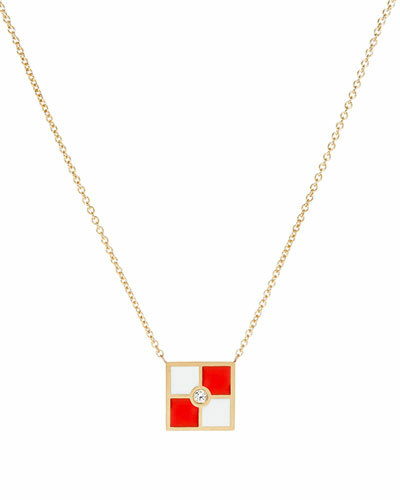 K Kane Code Flag Square Diamond Pendant Necklace - N Details Code flag square pendant necklace by K Kane. Maritime flag signal for the letter N. Polished 10-karat yellow gold hardware. Integrated flag pendant with diamond. 0.02 total diamond carat weight. Approx. 15"L; 2"L extender. Adjustable; lobster clasp. Made in USA. More Details K Kane Code Flag Square Diamond Pendant Necklace - L Details Code flag square pendant necklace by K Kane. Maritime flag signal for the letter L. Polished 10-karat yellow gold hardware. Integrated flag pendant with diamond. 0.02 total diamond carat weight. Approx. 15"L; 2"L extender. Adjustable; lobster clasp. Made in USA. 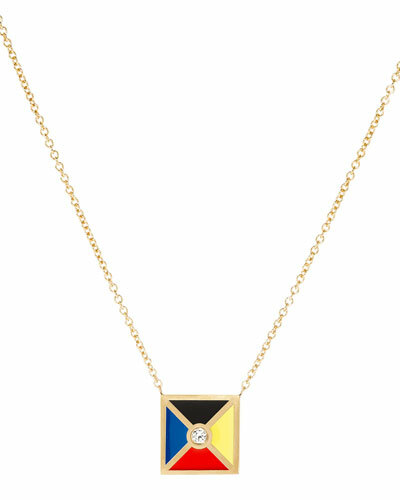 K Kane Code Flag Square Diamond Pendant Necklace - L Details Code flag square pendant necklace by K Kane. Maritime flag signal for the letter L. Polished 10-karat yellow gold hardware. Integrated flag pendant with diamond. 0.02 total diamond carat weight. Approx. 15"L; 2"L extender. Adjustable; lobster clasp. Made in USA. More Details K Kane Code Flag Square Diamond Pendant Necklace - O Details Code flag square pendant necklace by K Kane. Maritime flag signal for the letter O. Polished 10-karat yellow gold hardware. Integrated flag pendant with diamond. 0.02 total diamond carat weight. Approx. 15"L; 2"L extender. Adjustable; lobster clasp. Made in USA. K Kane Code Flag Square Diamond Pendant Necklace - O Details Code flag square pendant necklace by K Kane. Maritime flag signal for the letter O. Polished 10-karat yellow gold hardware. Integrated flag pendant with diamond. 0.02 total diamond carat weight. Approx. 15"L; 2"L extender. Adjustable; lobster clasp. Made in USA. More Details K Kane Code Flag Square Diamond Pendant Necklace - X Details Code flag square pendant necklace by K Kane. Maritime flag signal for the letter X. Polished 10-karat yellow gold hardware. Integrated flag pendant with diamond. 0.02 total diamond carat weight. Approx. 15"L; 2"L extender. Adjustable; lobster clasp. Made in USA. K Kane Code Flag Square Diamond Pendant Necklace - X Details Code flag square pendant necklace by K Kane. Maritime flag signal for the letter X. Polished 10-karat yellow gold hardware. Integrated flag pendant with diamond. 0.02 total diamond carat weight. Approx. 15"L; 2"L extender. Adjustable; lobster clasp. Made in USA. More Details K Kane Code Flag Square Diamond Pendant Necklace - U Details Code flag square pendant necklace by K Kane. Maritime flag signal for the letter U. Polished 10-karat yellow gold hardware. Integrated flag pendant with diamond. 0.02 total diamond carat weight. Approx. 15"L; 2"L extender. Adjustable; lobster clasp. Made in USA. K Kane Code Flag Square Diamond Pendant Necklace - U Details Code flag square pendant necklace by K Kane. Maritime flag signal for the letter U. Polished 10-karat yellow gold hardware. 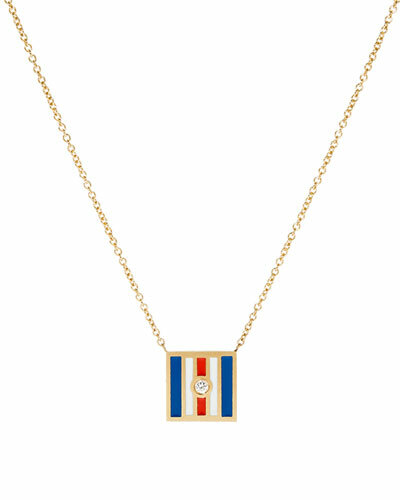 Integrated flag pendant with diamond. 0.02 total diamond carat weight. Approx. 15"L; 2"L extender. Adjustable; lobster clasp. Made in USA.